Biola has long respected the former UCLA basketball coach who passed at the age of 99 on Friday, June 4, 2010. Coach Wooden visited Biola multiple times and had a personal relationship with Biola's long-time Athletic Director and Head Basketball Coach, Dave Holmquist. Coach Holmquist was asked to provide thoughts about the late John Wooden, and he has done so in the form of a letter to his 2 1/2 year-old son, Tyler Holmquist. Read his letter to his son, Tyler. 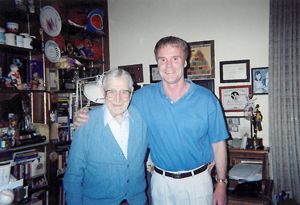 I first met John Wooden when I was 19 years old and was privileged to be his friend for many years. Yesterday John died. He was 99 years and eight months old. You are two years and eight months, a difference of 97 years. His very significant life just ended and your life is just beginning. I have thought often today about what that means . Thinking about his life has caused me to reflect on your life and so I want to write this letter to you. Much has changed since 1910. You were born into a very different world than John was. The changes have been so great that words cannot adequately describe what has happened. In fact, there has arguably been more dramatic change since 1910 than all of the previous years of recorded human history. It would be hard to overstate how different things are today. But the most important things in life do not change and that is what I hope, when you someday read this letter, that you will think about. In the past 24 hours the media has largely focused on John’s accomplishments. Much attention has been given to his teams winning 10 national championships in his last 12 years of coaching, his being the first person inducted into the Basketball Hall of Fame as both a player and a coach, and his being selected by Sporting News as the greatest coach in the history of any sport. These wonderful achievements, along with many others, provide a good picture of a very successful life. But they do not really communicate the essence of the man. And they do not address what John would have thought to be most important in life, whether a person was born in 1910 or 2007. At the core of John’s life was the capacity to love. This was best represented by his relationship to his wife Nell, who he was married to for 53 years. She died of cancer on March 21, 1985 and on the 21st of each month thereafter he would write a letter to her. In each letter he told what he was thinking and feeling at the time, and how the grandchildren and great grandchildren were doing. Then he would close each letter by conveying how much he loved and missed her. He told me one night that writing the letters to Nell really helped him cope with her being gone. Since John lived more than 25 years after Nell died he wrote and saved more than 300 letters to her. One night in the late 1990’s he read a few of them to me. Of course I felt very honored. When he finished reading he began to talk about her loyalty and what a wonderful wife and mother she had been. He went on to say that remarriage was not an option for him. While he thought it was fine for other people, Nell would be the only wife he would ever have. What I thought that night, and have thought many times since then, was how refreshing his words were. In this day of thin commitments and loyalties, it was encouraging to hear about two people who loved each other so much. People who really know how to love are usually not as vulnerable to the more shallow enticements of culture. That was certainly true with John. Economic success, which is the driving force in America today, was not that important to him. He never earned more than $33,500 as the UCLA coach and lived in a small and unpretentious condo until he died. Imagine the greatest coach in the history of sport living in a place that many young people would consider a starter home. I am sure that he could have pressured UCLA into paying him more. No college President or Athletic Director would want to be known for letting Wooden get away because they did not pay him adequately. He could have threatened to take another job or take his case to the media. But he never did. He also had shoe companies offer him money if his players would wear their brand. But he did not feel right about that so he turned down those offers. Through corporate speaking engagements and writing books he did make far more money after he retired from coaching in 1975. But his lifestyle did not change at all. He used that money primarily to establish education accounts for younger members of his extended family and to support other worthy needs. John was a man who loved to learn and read good books. A former English teacher, he liked to read and write poetry. He also liked to reflect on different proverbs, sayings, and aphorisms. During some of my visits he would read inspirational and instructive materials that he had collected over the course of his adult life. One night he read for almost three hours. I did not try to tell him what I knew or even ask questions. I just listened. Knowing who was reading the words, and the conviction with which he did so, made that time very meaningful. I did not experience any boredom or restlessness. At the end of three hours I was surprised by how much time had passed. While reading broadly can be very profitable, a person needs to be careful about it. The accumulation of too much truth, without adequate reflection, can dull rather than sharpen our spirit. We can become gatherers of information rather than pursuers of wisdom. While John did not read as broadly as some, he was an intensive reader. To use his words, he liked to drink deeply of what he read. Throughout his life he committed particular passages to memory. He thought deeply about what is important, believing that we need to be consistently reminded about values that we hold to be true. This allowed him to read, reflect and memorize with the goal of reinforcing the basic truths and values that he lived his life by. As serious as John was about life, he was also one of the funniest people that I have known. Very smart and witty, he was really aware of what went on around him. He had the eye and ear of a good storyteller, and because he led such an interesting life, had plenty of good material to draw upon. He told many stories about his coaching career and found special joy in describing the antics of former basketball coach Abe Lemons. Perhaps the funniest coach to ever live, Lemons was well known for his many quips and one liners. And John, who had developed a friendship with him, could quote almost every humorous line the man had ever spoken. The most important part of John’s life was his faith in God. It was the foundation for everything else and what sustained him through both his triumphs and difficulties. A World War II veteran, who experienced enormous pressures and expectations during those wildly successful years between 1963 and 1975, he did not lead an easy life. And when his wife died more than 25 years earlier than he eventually would, he was really put to the test. But through it all, the good and the bad, he looked to God for strength and hope. John’s faith in God and the love of his family is what sustained him after his wife died. But in observing his life I sometimes wondered what allowed him to become such a strong and good man. While there were many factors, he himself made it very clear that his dad had an enormous impact on the person he became. He had great memories of the example set by his father and throughout his life carried with him a seven point creed that his dad shared with him on how to live a good life. Tyler, my prayer is that I can have some measure of the influence on you that John’s dad had on him. My hope is that you will grow up to be a man of faith and lead the right kind of life. I have written this letter about John Wooden because he was a wonderful man and I want you to know about him. And I want you to begin thinking at a young age about the power of influence and how people impact each other. As you grow older I look forward to telling you more about other people I have known who lived well. What has changed in the last few weeks is that your mother and I have a second son and you have a little brother. Bryce is 31 days old and you are very excited that he is here. My hope for the future is that not only will his parents have a great influence upon him but that you will as well. As you grow older you will come to understand that each time a choice is made that strengthens your faith and character, that you will provide a gift not only to yourself but to him as well. Because you will be his hero, he will watch and learn from you. You will be a very important person in his life. And what really excites me is that you and I can be a team and influence him together. I know that in the process of doing this, that we are really going to enjoy ourselves.